Yes, this is just as good as it looks! I was going to use cube steak for this — beef is traditional, but I saw that pork was on sale at a local grocery store. We didn’t make it to that store as planned in time for the sale, however, so Brian suggested I use one of the pork steaks we had in the freezer. They had turned out to be a pretty crappy cut of meat, thin and fairly cut, with a decent size bone running through, but we got them at a supermercado because they were cheap. For this preparation they were perfect. 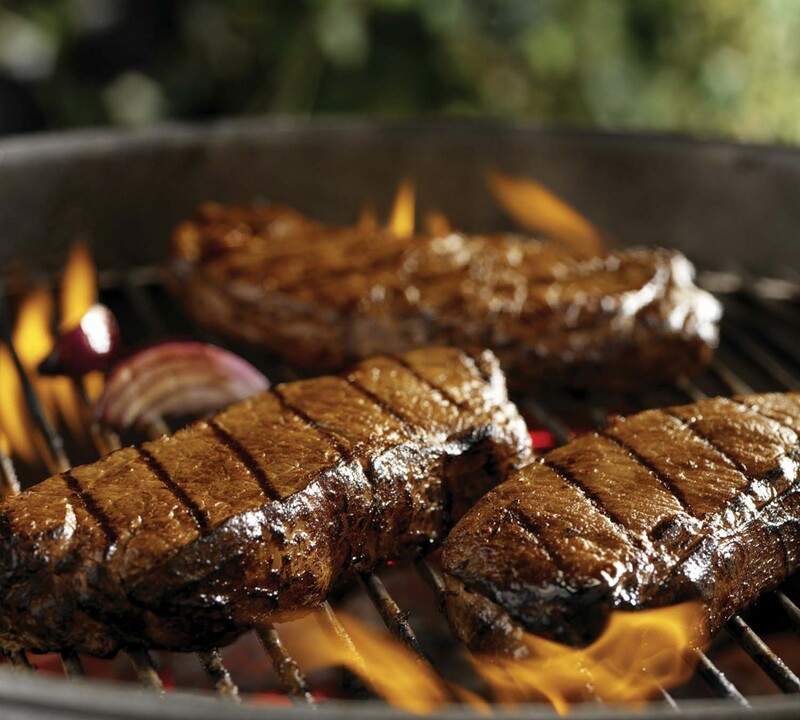 I started by removing the bone, and cutting the steak into smaller pieces for ease of handling, and so they would cook more evenly. I don’t have a meat tenderizer, but I used the dull edge of big carving knife to pound them out in various directions. I used plain pork rinds, although you can use flavored ones if you prefer, and/or add seasoning. I find that the saltiness of the plain ones, plus the pepper in the cream sauce, to be all the seasoning needed. 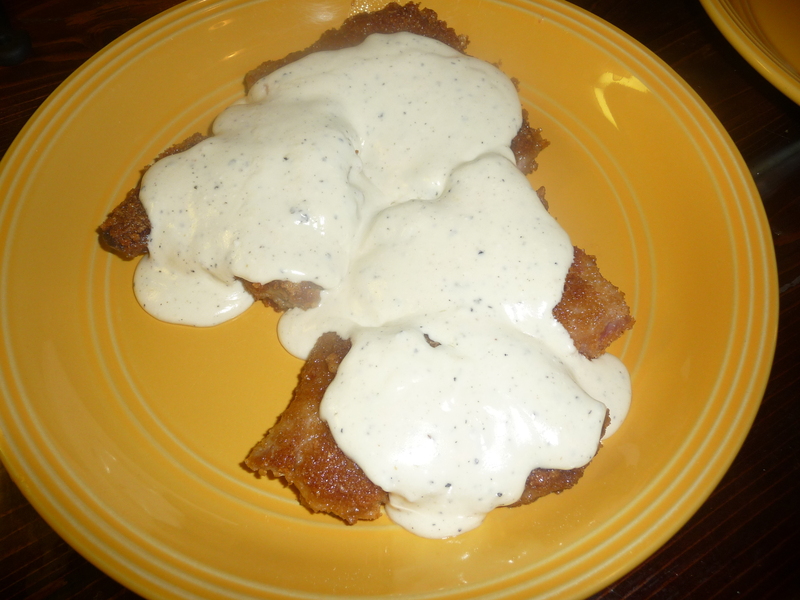 And if you guessed that the pepper gravy is a variation of my magic high fat cream sauce recipe, you get a gold star! Whisk egg in a container big enough to dip pork pieces into. Spread pork rinds out on a large plate. Dip each piece of pork into egg mixture and dredge both sides in pork rinds until all surfaces are evenly and well covered. 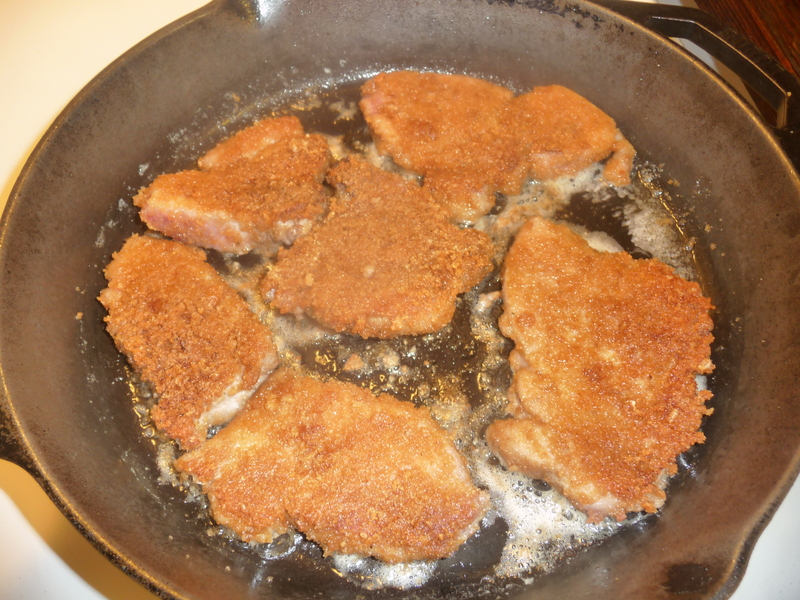 Melt butter (should equal about 1/2″ melted; add more if necessary) in skillet over medium heat and cook pork about 7 minutes on each side, until cooked through and pork rinds have formed a crispy, golden crust. Melt butter in saucepan over medium low heat. Use a whisk to stir in cream cheese until mostly melted. Hold sauce over lowest heat, stirring occasionally, until ready to serve. Down with the carbs and gluten…up with the fat and the delicious!